I get to the end of the comments and realize they were collapsed and have to go back and read them over again. Make it more clear that a comment section is collapsed by putting the "expand" (or whatever it's called) button at the top. Improve the logic behind what shows up in a collapsed comment section. Instead of just showing the highest comments, if popular comments are all responding to a particular user, show that users comments or something of that sort. This would make is so that you can get more value out of a collapsed comment section if you don't want to read the full thing. I've just found that the collapsing comment feature is pretty useless, and often wastes time. I think it would be better to change the line style between comments to be thicker when a comment is hidden between the two comments on either side of the line. The bottom line would also be thicker if there were hidden comments after the last one shown. I agree that the exposed comment system sometimes makes it hard to understand what is going on, especially if it is hiding comments prior to comments showing. I don't think that collapsed comments are a waste of time. I think they are useful because I often go past a series of a zillion comments. Especially on high traffic posts. That said, I think that there could be room for improvement. Your first two points ring home and I do both those things quite often. If I see "35 hidden comments" I will often not look at the set of current ones regardless of their upvotes and click on show all. This is because I have been burned so many times just reading the upvoted comments and missing the context for half of what was written. Comments do not have downvotes. Thanks, captain obvious. I know, but to me I think is a major concern because if a controversial comment is placed there is no way to tell. It just looks like it was wildly popular. +20, -200? 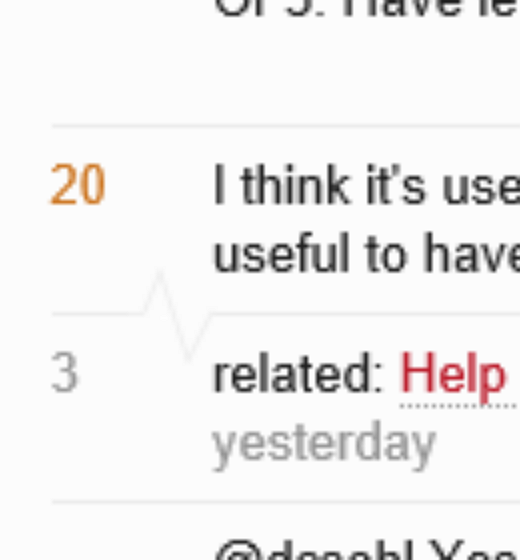 Just looks like +20, and all of a sudden it is featured in the list of "highlighted" comments. The subset of comments shown is supposed to give an indication of the overall conversation in comments by showing the "popular" comments. However, as there is no context for many of these comments and because the post most often becomes expanded in comments (and not in the post unfortunately) reading only the popular set is not very useful. Showing just the first set of comments regardless of votes before the cutoff would show an overall indication of what the comment conversation was going to include. I am not sure what the statistics are, but just like quick answers, quick comments often also generate the most upvotes. Mostly because a position is stated which everyone was thinking and instead of restating it they just upvote the comment. tl;dr; I would assert that showing the first set will still include several highly voted comments from the subset that is shown now, and also that it will give a better indication of the overall comment discussion because it will contain no gaps. You don't care about the answer much and then you don't care about the comments either. In this case showing only a part is fine and it could be even fewer. You care partly and want to know if someone said something important about it. Then showing the most upvoted comment is fine in theory, except that you often can't understand them because of lacking context (yet another problem is lack of comment downvotes as already said by Travis J). So it's usually a fail as you waste time on reading some gibberish. You're really interested and then you want to read it all. Now, you're wasting even more time trying to understand what can't be understood. So I'd say, it's plain wrong. In case of collapsed comments, the most important information is the fact that they're collapsed. This is the very first thing I want to know before starting reading any reply to anything hidden. A thicker separator line as proposed by Trisped would help, but I'd like to see something rather more visible and ideally clickable. As text usually doesn't fill all lines, adding a + or more button would often cost no place. Actually, the way comments get displayed should be the user's choice. If someone means, they're just garbage, they should see them always collapsed (or not at all). Other (including me) value comments and should see them somehow. As this can be implemented in the client, it should be pretty easy. You can install it from GitHub Gist. This will also be added to SOX in v2.0.0 (the next version), a userscript which adds a bunch of optional features to all the SE sites. For example, you can use SOX to add a feature that adds the 'show x more comments' link to the top of comments as well (as seen in the above screenshot). I too have similar experiences and issues with the comments and not seeing all of them initially. My inclination, though, is to go the opposite direction: hide all comments initially. Put a little triangle UI widget and a message to the effect of "13 comments hidden", and you can expand them all if you want, or you can get on to the dang answers already. Possible issues I see with this approach are that new users might not even realize there are comments, and would go put comments as "answers". I'm not convinced this would happen more than already happens, though, since you have to get some reputation to even post comments and by then I'd hope they have it figured out. But in general, I say let's try cutting down the chatter except for those who want and like it. This seems like an area where it would be perfectly reasonable to apply a user preference for the display options - there is a whole spectrum of people with differing styles and approaches, from those who want to see all comments without hiding (so context is clear, even at the expense of additional lines to plough through) to those who aren't interested in comments at all (hide the noise). I think behavior is ok and does not need to be changed. Showing 5 comments on SO/25+ on META is desired* behavior as it stands now. Comments are not expected to have content that is essential to the answer - so showing just several top-rated comments is approach aligned with "non-essential" treatment of comments. If you feel that particular high traffic post have too many comments/chat/discussion that are obsolete - flag whole thread for moderator to remove obsolete comments. For low traffic posts consider doing nothing or marking individual comments obsolete. 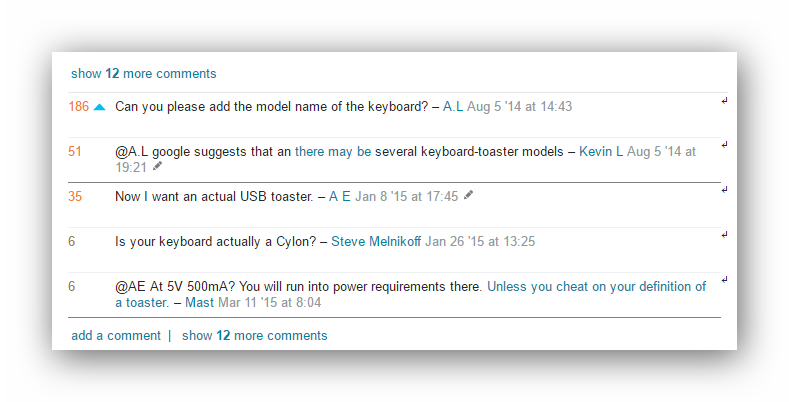 You can also propose edits that inline important comments into answer/question and than vote to delete comments. *Note if you think comments serve some other purpose (like part of question) than indeed it is not "desired" behavior. Answering a question with a bounty. Update old answer, or start a new answer?